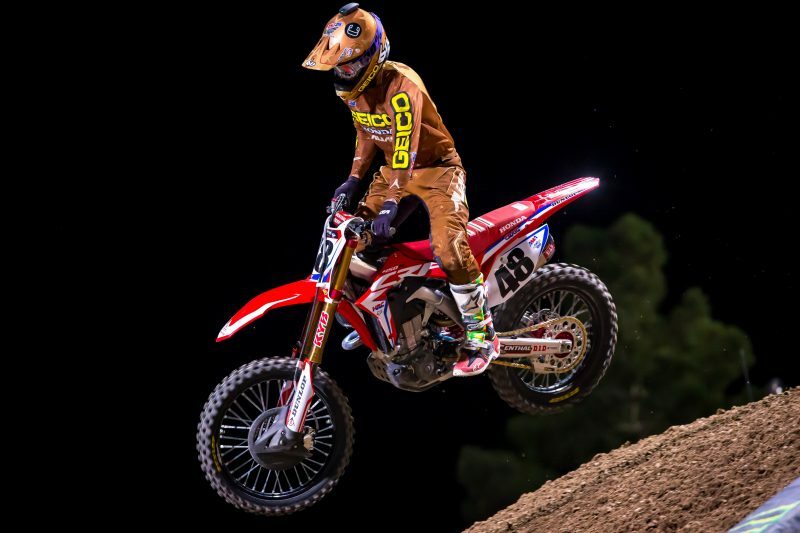 The 2017 AMA Supercross series came to a close for Team Honda HRC at Las Vegas’s Sam Boyd Stadium, with Christian Craig racing to a respectable 11th-place finish while filling in aboard a factory CRF450R. 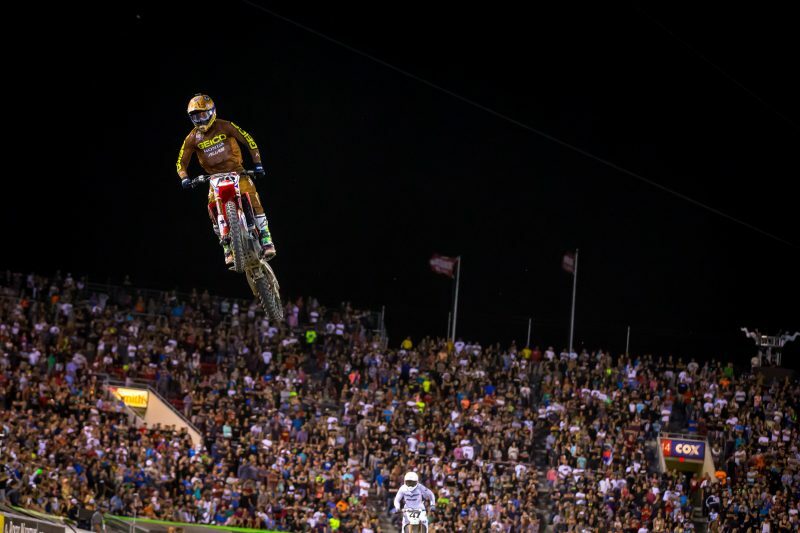 In the final main event of the year, Craig put together a similar performance to his previous appearance with the team (Salt Lake City), getting a poor start but methodically advancing through the pack. 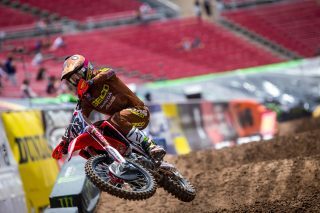 By the completion of the 20-minute-plus-one-lap race, he had advanced from nearly last to 11th. 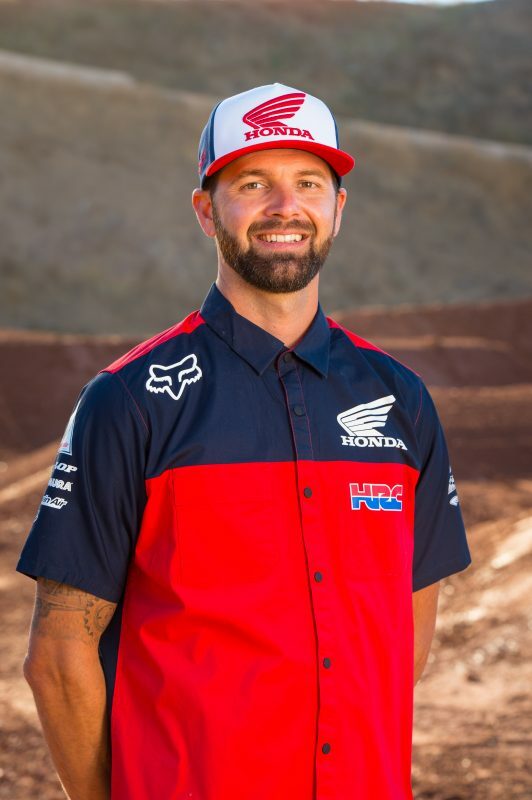 American Honda and Team Honda HRC extend their congratulations to Ryan Dungey and the entire Red Bull KTM team for securing the 2017 AMA Supercross title. Although he didn’t compete in the series finale, Cole Seely was present at Friday’s pre-race press conference to address the media regarding his injury and answer questions about his season. 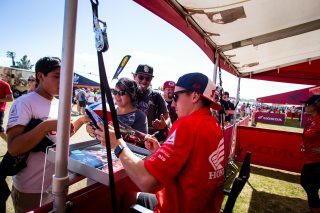 Later that evening, Seely was joined by Andrew Short and the GEICO Honda squad at Carter Powersports to sign autographs for fans. 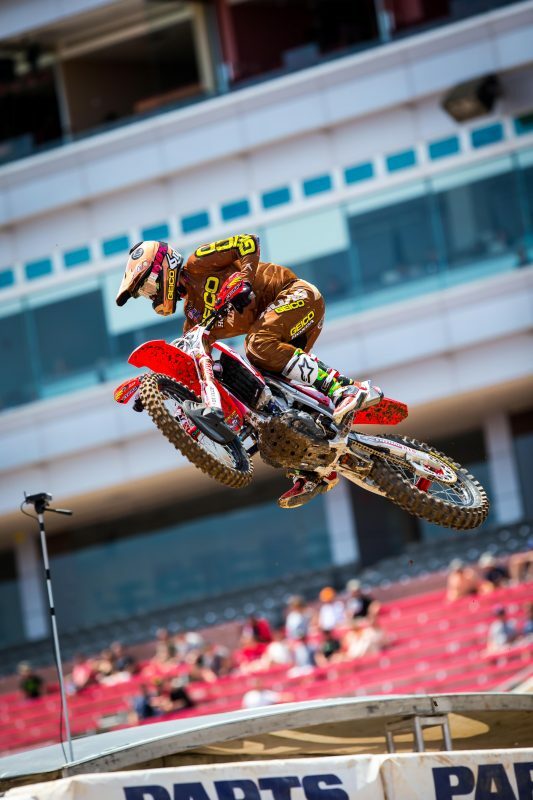 With lap times over one minute, the Las Vegas track was one of the longest of the season. During the daytime program, Craig logged the 13th-quickest qualifying time at 1:07.735. 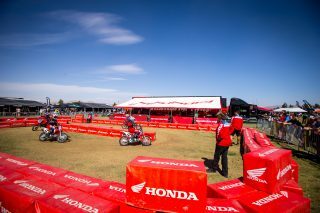 The Las Vegas Supercross marked the third time this season that Team Honda HRC’s technical and hospitality trucks were only a portion of Honda’s footprint in the pits. Under a third truck, fans got the opportunity to take part in a popular learn-to-ride program for kids. Slotted in the second heat race for the night program, Craig flinched off the start and was pushed wide in the first turn, coming around in 10th. He worked his way into eighth, which is where he would finish, forcing him to qualify through the semi. 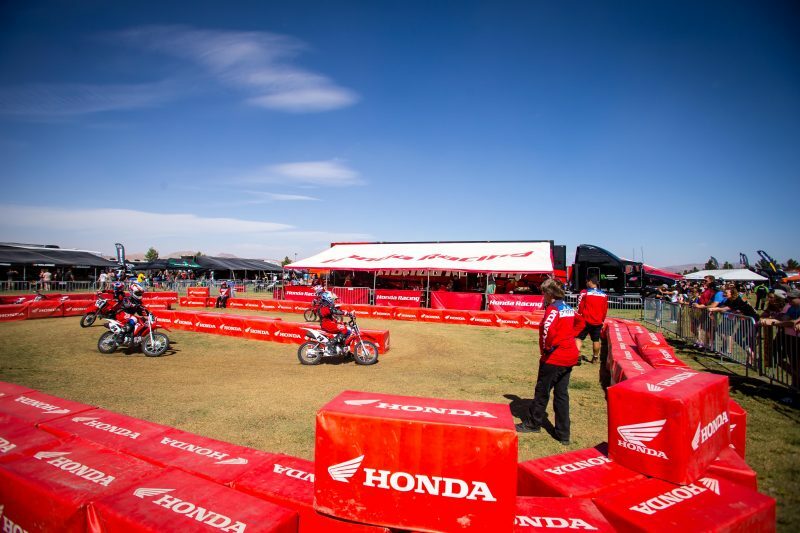 In semi 1, Craig launched his Dunlop-equipped Honda CRF450R to a fourth-place start but made the pass into third in the opening rhythm section. He maintained that position to the checkered flag, advancing to the main event. 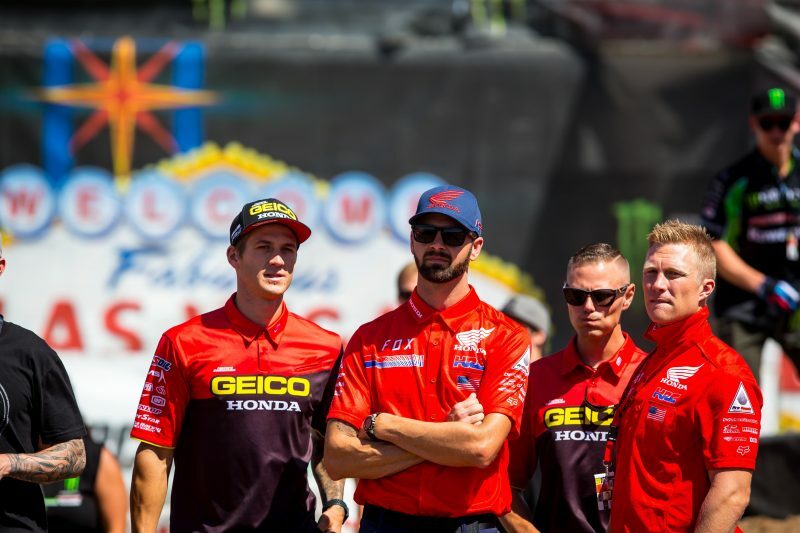 With the AMA Supercross season completed, Team Honda HRC will enjoy a welcome weekend off before kicking off the AMA Pro Motocross championship on Saturday, May 20, in Sacramento. 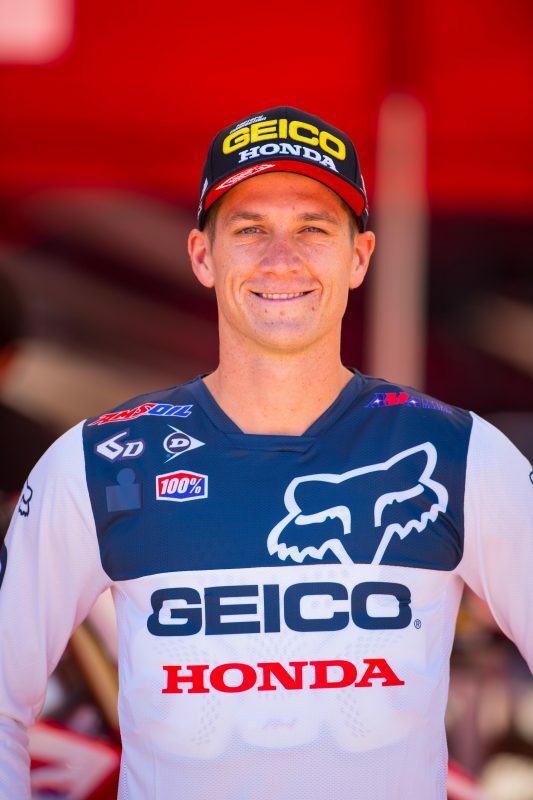 Although Team Honda HRC had hoped for more from the 2017 AMA Supercross series, riders Cole Seely and Christian Craig, along with the entire crew, are eager to turn the page and start a new series fresh. 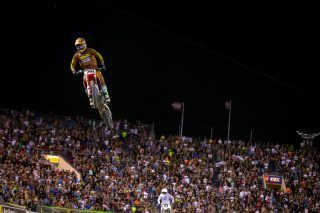 I got the call on Wednesday to jump up to the 450 for this weekend. I was excited to get some more time on the bike and with the team prior to outdoors. The day started off a little rough. I was struggling with myself and the bike during qualifying, but luckily it’s just practice and doesn’t mean a whole lot. I just tried to go into the night open-minded. 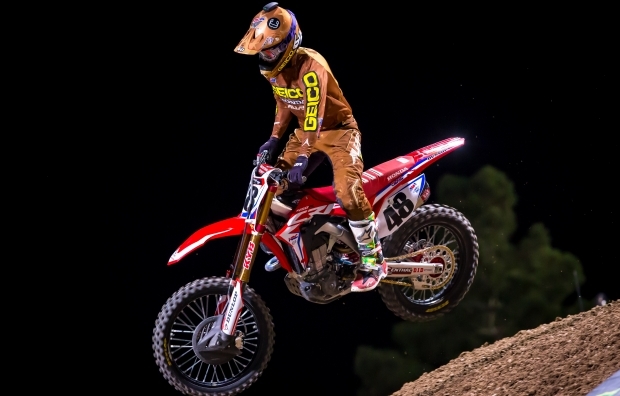 I got into the main event through the semi and felt like I was riding good. Unfortunately, I got another terrible start in the main. You can’t start that far back and expect to do very well. I just put my head down, charged as hard as I could, made some great passes, and put myself in a decent position. I wanted top 10 again and just missed it with 11th, but I’d say this ride compared to Salt Lake City was better because I was moving forward and had some intensity. Overall an okay night but I want to do better and know I am capable of better. I think tonight went pretty decent. Things started a little slow but I think Christian rode well in his semi, making passes early and putting in some good laps. 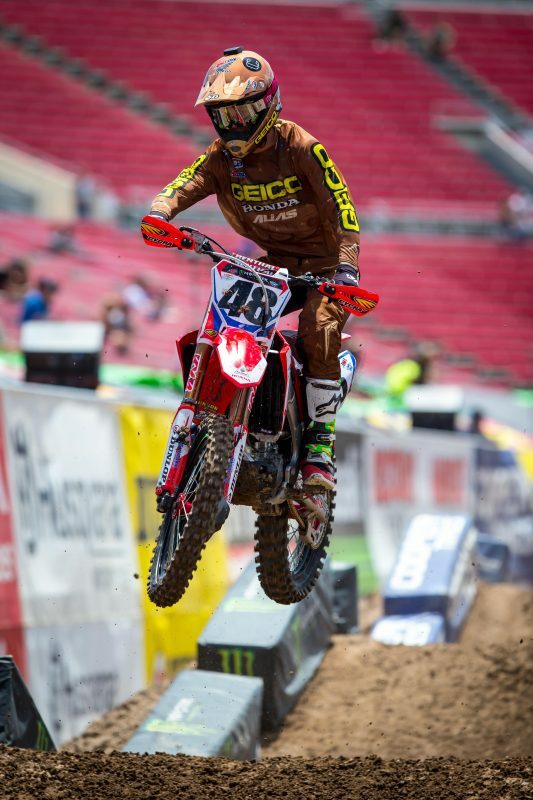 He rode well in the main too but got a terrible start and had to make his way through the field. We have a good relationship and have worked together in the past so it was fun to spend the day with him even though Oscar [Wirdeman] will be his mechanic for the outdoors. 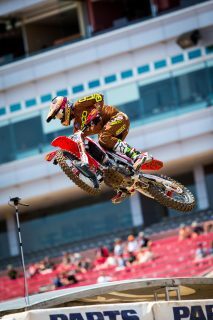 I’m looking forward to having Cole back for Hangtown.